This dip is quick and easy to make, delicious, and healthy. No cooking involved. Just grab the blender and go. Chickpeas (also known as garbanzo beans) and tahini (a paste made from roasted sesame seeds) combine to make a tasty appetizer to serve with wedges of pita bread. A favorite in Greek restaurants outside Greece (see note below the recipe). The key to great hummus is to let the flavor of the chickpeas come through, rather than be overwhelmed by the lemon (it’s easy to get too much lemon taste). Put 1/2 the lemon juice and all ingredients into the blender except the chickpeas (and the parsley and oil for garnish) and blend for 5 seconds. Add the chick peas and blend on high until it reaches the the consistency of sour cream, but granular, about 10-15 seconds. Blend in remaining lemon juice to taste. If the dip is too thick but you don’t want to add more lemon juice, add a little water slowly and blend until it reaches the correct consistency. About Hummus and Greek Food: Hummus is a dish that originated in the Middle East, and is not usually found in Greece. 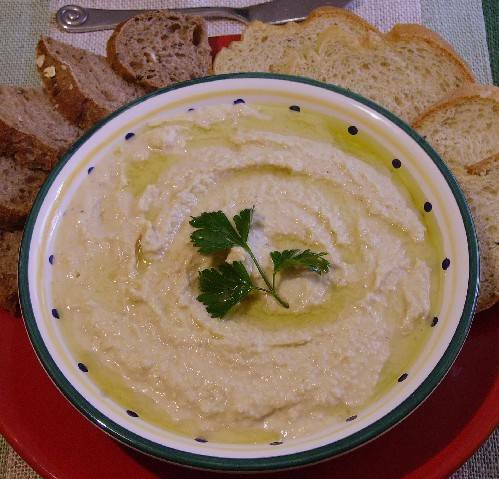 Early Greek restaurateurs catering to local tastes outside Greece added hummus to the menu. Here on the site, there is just this one recipe, a tribute to many Greek restaurants around the world that include it on the menu. articles. I’ll bookmark your weblog and check again here regularly. I am quite certain I will learn plenty of new stuff right here! Good luck for the next!